How efficient can we make Westminster on this year’s Energy Efficiency Day? We’ve been recognising some hugely positive environmental campaigns in the past few weeks, including Zero Emissions Day and Recycle Week. If you didn’t manage to organise any sustainability initiatives at work around these dates, then you have another opportunity coming. On October 5th we’ll be highlighting Energy Efficiency Day as a great opportunity to save money and the environment. Although this is a fairly new ‘environmental day’, the first one running only a few years back in 2016, it is no less important than some larger and more well-known movements. The main goal of Energy Efficiency Day is to share tips, tools and stories that promote the benefits of energy efficiency, including lower costs and healthier homes and businesses. So how can you get involved and let us know what you are doing? Switch to LED light bulbs. LED bulbs are already being used in many homes and businesses, but there are plenty still using incandescent bulbs in use. LEDs not only use up to 90% less electricity than incandescent bulbs, but they also last at least 25 times longer too. Use energy star products. These products will help you to save energy and money at the same time. Now is your chance to upgrade one of your old appliances like that old fridge or tired microwave. Switch to Westminster City Council’s Commercial Waste Services. We can help you save energy by recycling your rubbish. Recycling materials uses a fraction of the energy needed to produce them from new virgin resources. Even what cannot be recycled is not wasted. We can collect your general waste and use it to generate a huge amount of clean energy for London homes and businesses. Find out how we’re able to do this later in this blog. First of all, you can show your support for Energy Efficiency Day by joining the list of 2018 participants. Secondly, you can tell us what you are doing to become more energy efficient in 2018. You’ll be encouraging other organisations to take a few simple steps to act positively for the environment and reduce costs at the same time. Fill out this form and we’ll publish your submissions and share the things that are happening in Westminster to become more energy efficient. Extracting and processing raw resources (wood, oil, ore, etc) to make new materials (such as paper, plastics, metals) requires a lot of energy. Recycling normally saves energy because the materials being recycled usually require much less processing to turn them into new materials again. The largest savings are often made when recycling metals as these materials take a huge amount of energy to create from scratch, but only a fraction of that when recycled. For example, recycling aluminium can save up to 14,000 kWh per tonne. That is the same amount of electricity which 4 British households use on average over a year. Paper recycling not only saves trees from being turned into new paper but it also saves significant volumes of water and chemicals needed to produce it. Most energy, such as the heat and electricity which are used to manufacture new materials and products, is obtained from burning fossil fuels (coal, gas, oil) which submits significant quantities of carbon dioxide. Recycling your rubbish saves energy and with it prevents the emission of greenhouse gases such as carbon dioxide. Whilst we always encourage businesses to recycle as much as possible, it’s inevitable that some general waste will always be produced. This is the waste that cannot or should not be recycled; polystyrene, wood and food soiled packaging for example. You need a waste collector for this who can come up with a solution that does not involve sending waste to landfill or abroad but instead turns it into energy for homes and businesses. No waste collected by us is sent to landfill. The general waste that we collect is sent to SELCHP in southeast London. This energy recovery facility uses state of the art technology to turn general waste into renewable energy in the form of electricity and district heating. Every bag of general waste generates enough hot water for 7 showers or nearly 24 hours of watching TV. Any ash left after the combustion process is turned into a building aggregate. It has been used in major civil engineering projects such as the widening of the M25, Highspeed 1 and as a base for the 2012 Olympic Stadium. In line with the London Mayor’s Environment Strategy we ensure waste is treated within London. If you want to see where all of the waste that we collect goes, download our infographic on this. Take a look at how the SELCHP energy recovery facility works below. How do I start saving energy from handling my waste better? 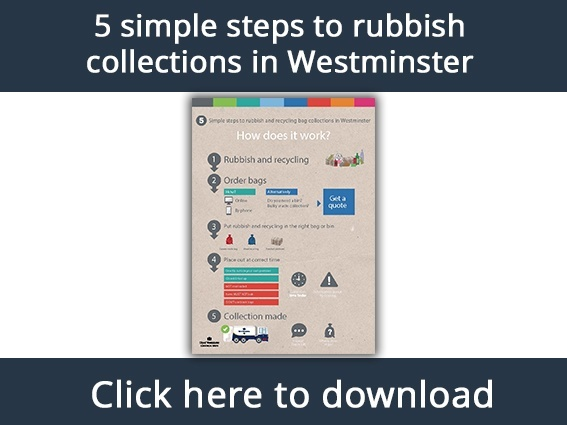 We have produced a simple 5 step guide, showing you exactly how to get started with waste and recycling collections in Westminster, get your copy below.